After accommodations, food is our next largest expense but for most backpackers, food costs surpass lodging because, though on a budget, frugality is not a lifestyle. Sure we could cut our trip duration in half and spend twice as much on food but that would defeat the purpose of longterm travel. Also for us, the art of traveling on a budget applies the same behaviors adopted in our ultra frugal lifestyle when at home. Just because we have the money does not mean we need to spend it all. In nature there are producers (plants) and consumers (animals), likewise in any economic system, there are producers (investors) and consumers (spenders). In nature, producers far outnumber consumers and have existed long before them. To hold close the value of freedom, you must be more a producer than a consumer. 1.Prepare as much of your own food as possible. Try your best to find budget accommodations that include a communal kitchen. This will allow you access to a stove top and a refrigerator so you can buy and cook in bulk, then store your leftovers. 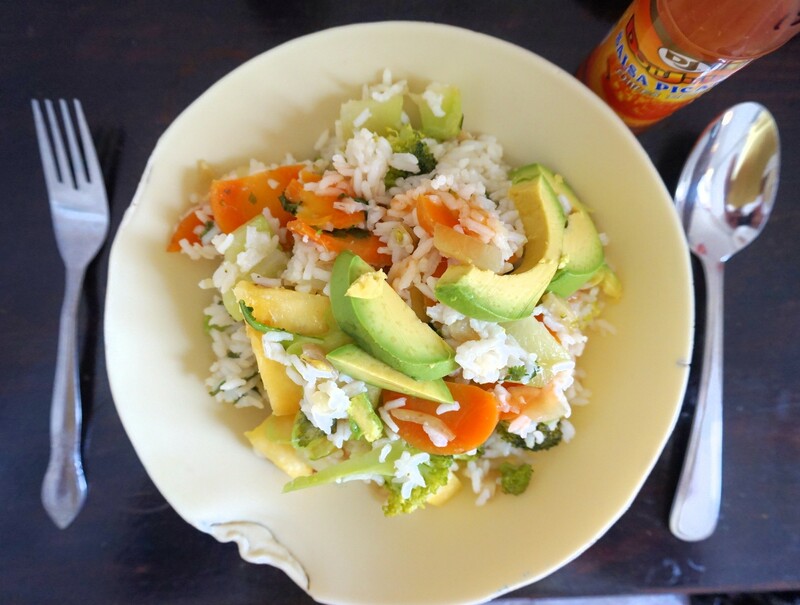 On Utila, a heaping bowl of veggie fried rice will set you back 100 Limpira at most budget restaurants. I just made an entire pot, enough for six heaping bowls, for roughly the same price. 2.Be prepared to eat leftovers. Having healthy leftovers on hand prevents the need to eat a fast food snack because you are too hungry to prepare an alternative. Shop and cook when you are satiated and eat when you are hungry. It is not uncommon for your mom and I to eat the same lunch and dinner three days in a row. Since eating leftovers removes the novelty from food, you are less likely to overeat. Food should be more about fuel than about pleasure so that when you do treat yourself, it is actually more pleasurable. We like to find bakeries when traveling and enjoy the treats much more because they are uncommon in our diets. 3.Avoid eating animal products. When traveling in foreign countries, the most common causes of stomach illnesses are from drinking bad water or eating meat. Though the meat in developing countries is far more organic and free range than meat found back home, most small restaurants do not have electricity, let alone a refrigerator to prevent the meat from spoiling. If you are eating yesterday’s kill, you may be in trouble. In addition, eating meat greatly increases your ecological footprint. In many developing countries, huge swaths of once biodiverse forests have been clearcut for cattle ranching. Lastly, no matter where you live (except the Arctic), one gram of protein from meat will always cost more than double the equal weight of a plant based protein. Remember that a complete protein is found when you combine a legume with a grain and every culture unknowingly combines the two which form the staple of their diet (rice and beans in Latin America, hummus and pita in the Middle East, rice and lentils in Central Asia etc.). Finally, when alternative sources of calories and proteins are available, there is no good moral reason to kill another life to sustain our own. 4.Eat oatmeal for every breakfast. Oatmeal is by far the best value breakfast, a super food for a low cost. Quality of sleep and regularity of bowel movements (at least one per day) are two of the most important health diagnostics. Quality of sleep comes more from peace of mind than from an expensive mattress and oatmeal will help keep you regular. Mix it with any fruit, cinnamon and a splash of hemp hearts. 5.Be creative. In Honduras, baleadas are the most common snack. They are very similar to a large bean burrito. You can buy a simple baleada for 12lps (large soft tortilla with beans) or a super baleada for 35lps (tortilla, beans, tomatoes, avocado, lettuce and meat). However, for 20lps you can buy enough tomato, avocado and lettuce to make three super baleadas. This means you can now eat three super vegetarian baleadas for the price of one. Though these savings seem trivial, over a four month span they really add up. 6. Share what you have with others. When you give, you always receive but giving without the expectation of receiving is an ingredient for happiness. Sharing meals always leads to great conversations and the building of community. Asher, you have been very adventurous with your eating since our arrival on the island. You are eating carrot, potato, squash, cabbage, tomato, broccoli, avocado, rice, beans, orange, cantaloupe, and pineapple. But just like mom and dad, your favourite meal is your morning oatmeal and banana! Since leaving the camp (mid October) you are really eating so many new foods. It looks like you are enjoying them. I can see how healthy and happy you look! Dear J&A Thanks again for all the nutrition info. and hints. How much is a Limpira in relation to our dollar? It is so remarkable that every country has its own specialties! I have never tried a baleadas. Sounds good! 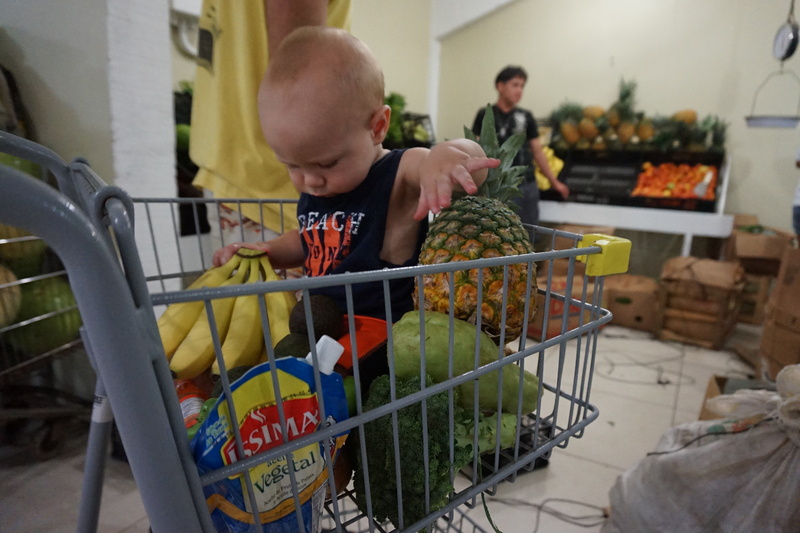 The grocery cart looks like it is heaping with health and right in the middle is sweet Asher. Thanks for the blog. Hugs to you all. We exchanged US so 22 Limpira = $1 USD. So 1 orange = 2 lmp. So 11 oranges = 22 lmp = 1 USD. Haha nothing beats bananas for kids! Emrys is still eating a ton of them, still his favourite food since they were called ‘nanas’! Great blog about the food choices!